Shared Gmail Labels help you collaborate with your teammates by sharing email conversations with them. If you share a Gmail Label called “New Lead” with your team-mates, then whenever you add that label to an email in your Gmail inbox, the email appears in your colleagues Gmail accounts too with the label “New Lead” attached. Hiver Shared Labels work with all the famous email clients like Outlook, Thunderbird, even in the Email app on your mobile devices. You can create a new Shared Label or you can share an existing Gmail Shared Label. You can find the option to do either from the same page. Open the email for which you wish to create a Shared Label. Click on the Hiver action bar above the email. Type out the name of the Shared Label that you wish to create. Click on Create New Shared Label. 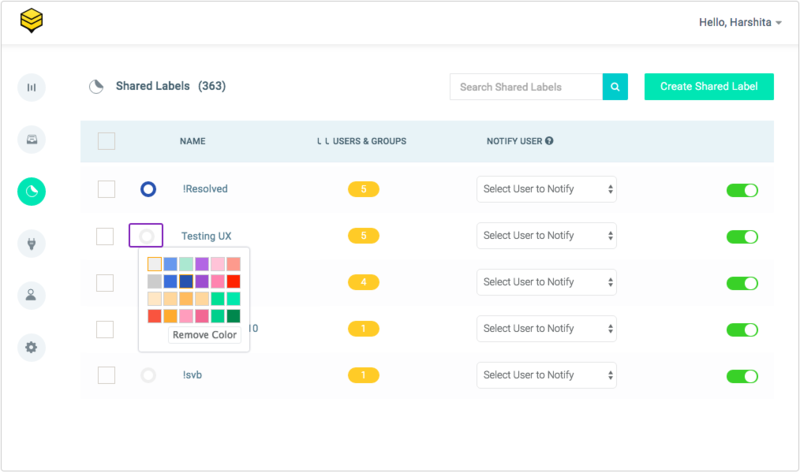 This will take you to the Hiver Shared Label creation page from where you can complete the process. Click on the small arrow beside the Gmail label that you want to share. Choose the option Share Label from the dropdown that opens. You will be taken to the Hiver Shared Label creation page in the Hiver Admin panel from where you can proceed as usual. Manually adding the label to the emails. Automating label addition by using Gmail Filters. Labels can be manually added to the emails by using the Hiver Label option on the top-right, adjacent to Gmail's "More" button. Pick the label you wish to add to his email from the drop-down. The selected label will be applied to the email and it will show up under that Shared Label folder. Depending on your configuration of the Advanced Options, this label will also be removed from the Inbox. Select Gmail Settings "Gear Icon". Gmail Filters can also be created from the Search bar, using the downward arrow before the magnifier icon. Choose Settings from the drop-down. Click on Create a New Filter and define the conditions. Choose Create a Filter with these conditions. Select the checkbox that reads Apply Label and choose the Hiver Label from the drop-down list beside it. You can also select to apply a filter to matching conversations as you are creating it. Apart from serving as a means to share emails amongst users, the Shared Labels can also double up as task delegations. 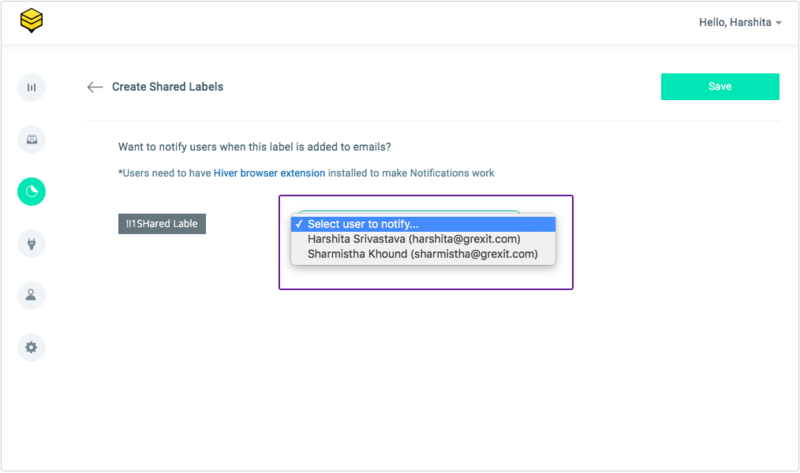 This would mean that a specific user can be notified each time an email is added to a label. Now you will be asked whether you wish to notify a specific user about emails in this Shared Label. 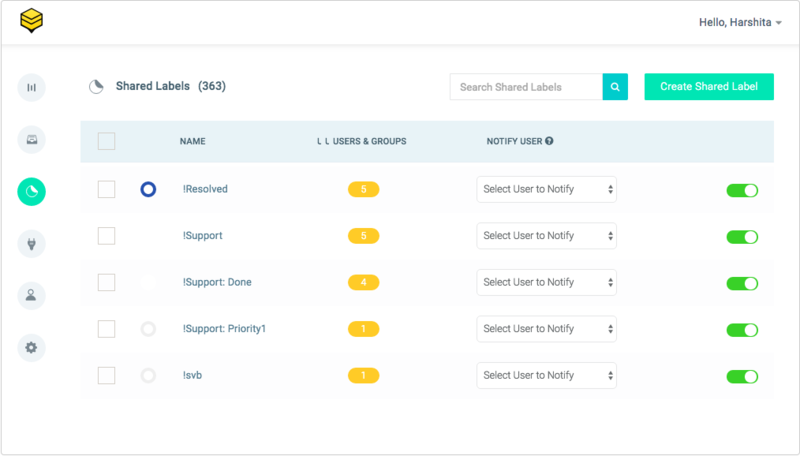 Selecting a user here will ensure that the user is notified each time an email is added to this Shared Label and any email added to this Shared Label will also be copied to her Inbox. TipNoteWarningYou can change the user anytime by editing the Shared Label. Pick a color from the palette drop-down. Follow the same steps for color coding a sub-label as well. Pick a new color from the palette drop-down. Follow the same steps for changing the color of a sub-label as well.